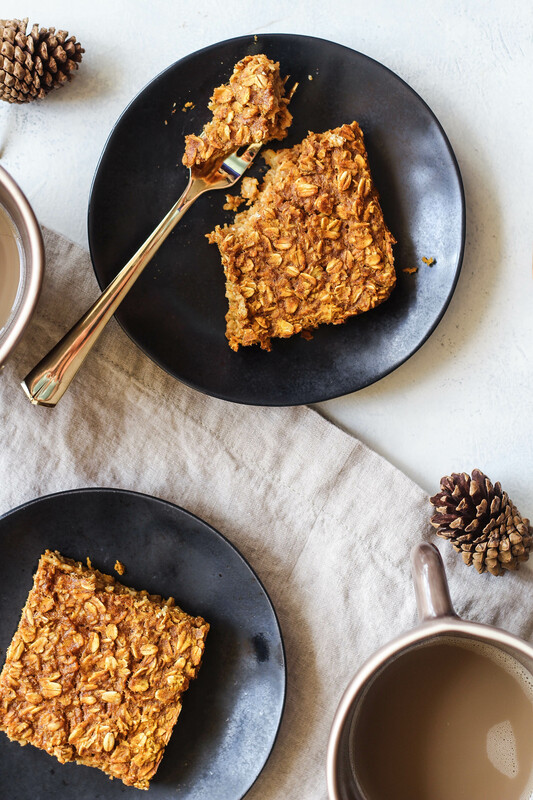 This Baked Pumpkin Oatmeal is the ultimate way to celebrate the Fall season. It’s warm, spicy, and hearty nature will give you a boost of energy to start your day! HERE IT IS PEOPLE. PUMPKINNNN. Okay self, slow your roll. Truth be told, I’m not actually obsessed with pumpkin like many people are. I simply love the Fall season, and when I start making recipes with pumpkin, I know Fall is near, SO I LOVE PUMPKIN. 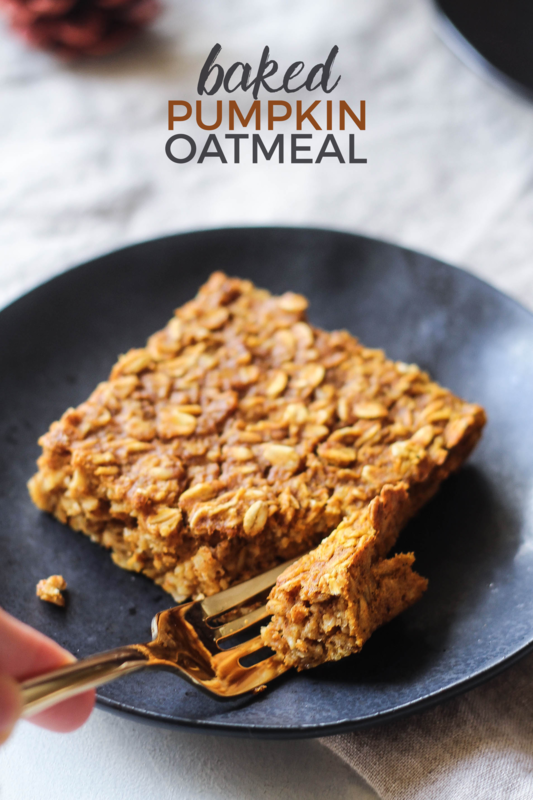 I don’t know if it’s the texture or the flavor or the simplicity or all of it, but I seriously love baked oatmeal. 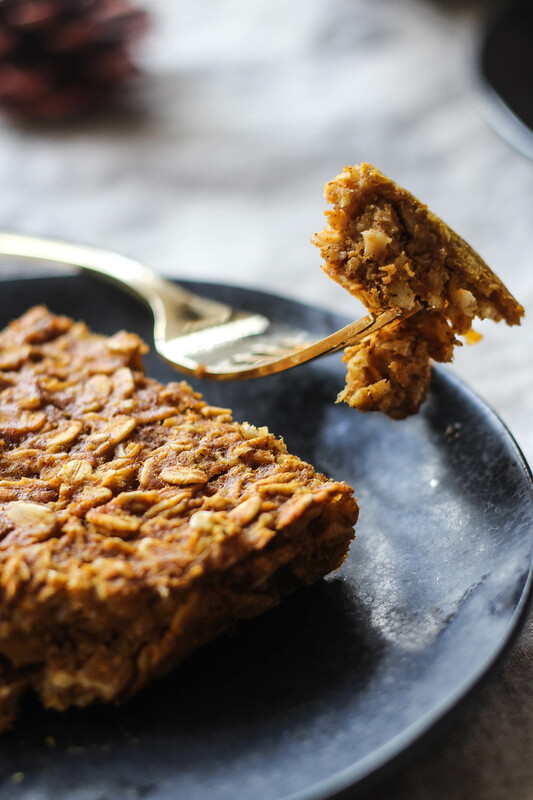 You can make a big batch of it on a Sunday and enjoy it for breakfast all week. Anything in the kitchen that makes my life easier, ya girl is down with it. 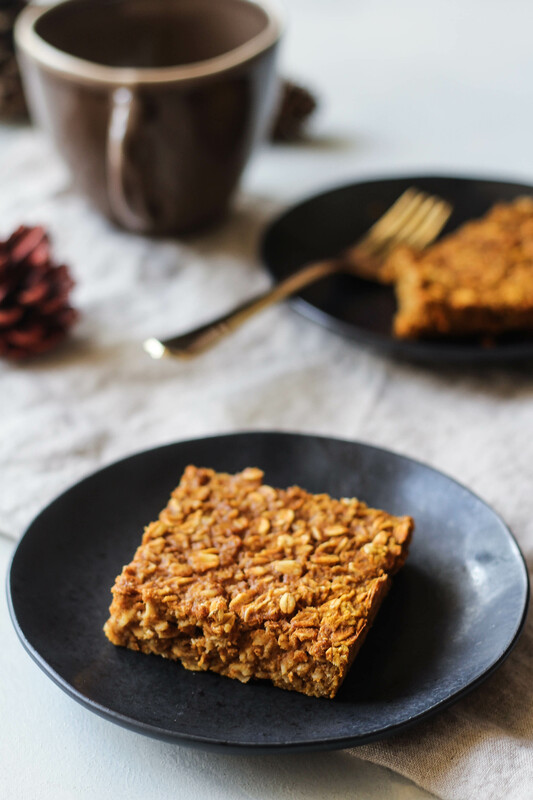 Last year, I made a holiday-inspired baked oatmeal that was a huge hit. I fell in love with the warm spices and moist yet crispy texture, I had to share another with you. It truly is the perfect way to enjoy breakfast during this autumn season. 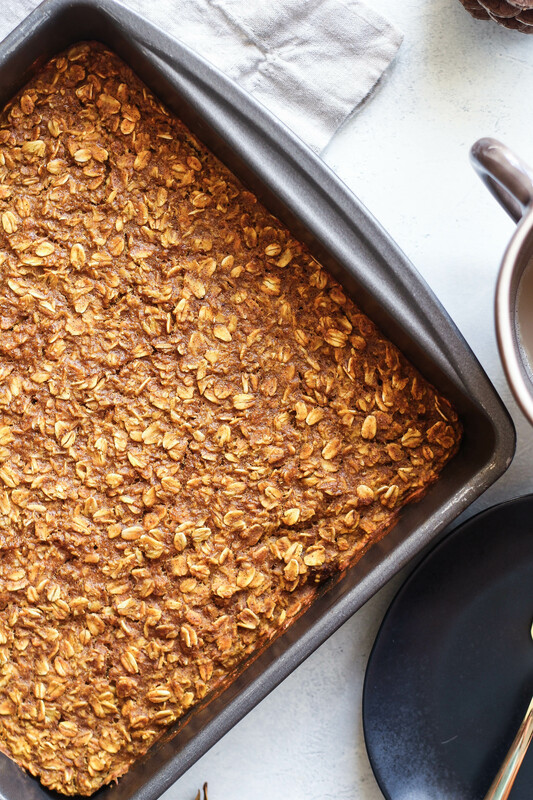 I truly think I will be continuously making this baked oatmeal for the rest of the season. For some reason, when it comes to making breakfast, I am anything but energized. What I’m trying to say, is I’m lazy. Yeah. My morning routine is: coffee + emails + [try to] relax, workout, breakfast + start my work day. By the time breakfast rolls around, I’m in a hurry and need to start working for the day. Hence why this baked oatmeal is so perfect. The process is as follows: remove from refrigerator, scoop out a large piece, heat in microwave or oven, devour. Repeat, if you get down like that. 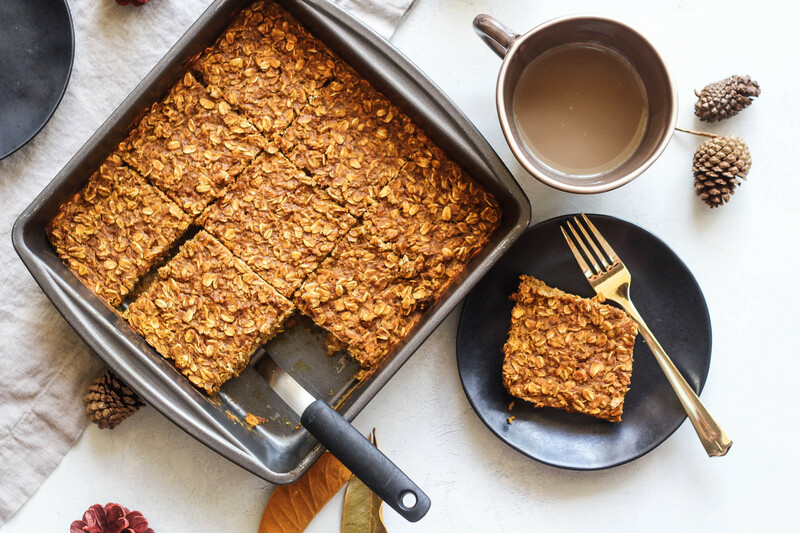 I seriously hope you guys make this Baked Pumpkin Oatmeal!! Preheat your oven to 350 degrees and grease an 8x8 baking dish. Add eggs to a large bowl and whisk to scramble. Add in pumpkin, almond milk, and vanilla. Whisk to mix well. Add honey and brown sugar and mix well. Add cinnamon, pumpkin pie spice, nutmeg, and oats. Stir to combine. Pour batter into baking dish. 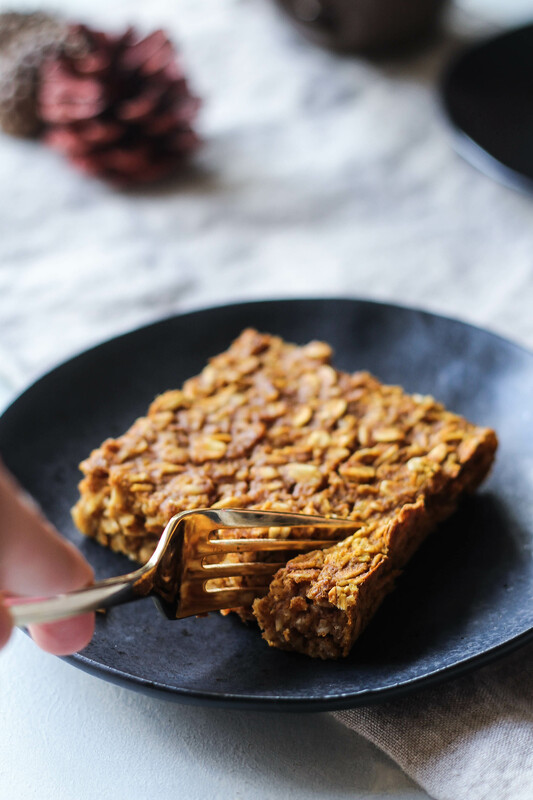 I LOVE the texture of baked oatmeal and for some reason I’ve been on more of an apple kick than a pumpkin kick lately? Maybe my pumpkin obsession will happen soon or maybe this year is just the year of the apple. Ok I have no idea but yay for lazy breakfasts! All about it. NOMMM. Hello to Fall!!! What a perfect recipe for it! You’ve got a baked oatmeal fan here too; my favorite kind is blueberry baked oatmeal, but I think I need to try pumpkin. I love all the fall flavors including pumpkin, lots of apples, and pears. Emily recently posted…What is Real Worship and Fake Worship? I love me some pumpkin oatmeal! This looks so good–perfectly spicy and sweet! My favorite fall foods are apples and pumpkins (so average, haha)–but apple or pumpkin pie has to be my all-time favorite! I totally agree – not average in my book!! Okay this looks amazing and something I need to make right now! Thanks girl!! Hope you like! Yum!!!! so many pumpking around at the moment!! I think I’m more excited about the weather getting cooler so I have an excuse to wear baggy sweaters, drink red wine, and eat all the food rather than a particular fall food!! Yes and then heat up as you go.